For anyone turning salt and pepper mills using a CrushGrind mechanism, this is an essential tool in obtaining the correct depth and size of recesses needed to enable the mechanism to work correctly. The step or shoulder of the tool gives an accurate position of the recess required for the base section of the mill. The small V notch on the right hand side allows the other groove to be produced in the top section when it is lined up with the outer face. The CrushGrind tool will give accurate and effortless results time and again. 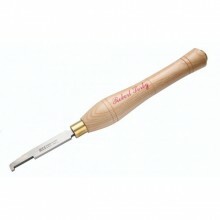 Click the button below to add the Robert Sorby Crush Grind Tool to your wish list.